Today’s photo is another from Cornwall, this time, the magical St. Michael’s Mount. Only accessible vie boat or by the causeway when the tide is low, this beautiful National Trust Property off the south coast of Cornwall hosts a castle, a small port and a few shops and cafés that serve the location’s many visitors. 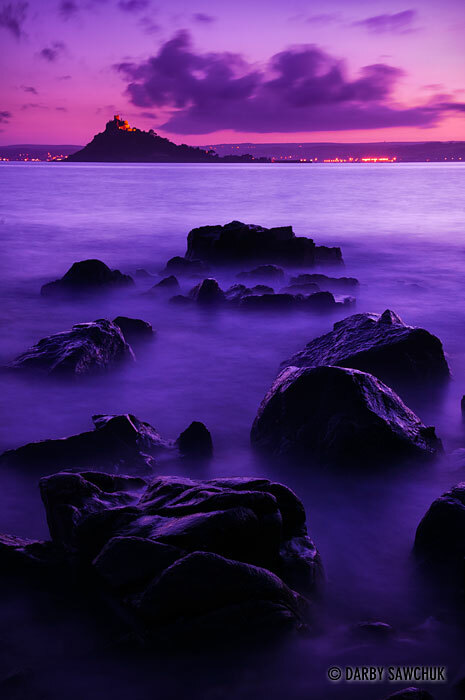 The island is accessed from the small town of Marazion, but this sunset/dusk shot comes from further East along the coast. I chose to move away from the relatively featureless coastline near Marazion to be able to get some foreground interest and these rocks fit the bill perfectly. I did a 30-second exposure to flatten out the ocean right when the sky and the lights of the distant towns are balanced. Mother nature took care of the rest with a gorgeous sky. This entry was posted on Thursday, July 29th, 2010 at 1:21 pm. It is filed under Blog, England, Photo of the Day, Photography and tagged with cornwall, landscape photography, Photo of the Day, Photography, potd, st michael's mount, travel photography. You can follow any responses to this entry through the RSS 2.0 feed.